North Korea's recent test of an intercontinental ballistic missile has increased the danger the country's leader Kim Jong Un will be able to strike the United States sooner than expected, the commander of U.S. Forces Korea said on Wednesday. Commenting on reports that the July 4 test of what the military is calling a KN-20 missile moved up estimates of the timeline for fielding a reliable long-range nuclear missile, Army Gen. Vincent Brooks, the commander, said in a brief interview, "We believe they have." "It is a bit of a game changer for us," the four-star general said of the missile test that flew 1,700 miles into space and flew for 37 minutes—longer than any previous North Korean missile flight test. A defense official said the new intelligence assessment, which was presented to Congress on Wednesday, concludes that North Korea's missile program is advancing faster than earlier estimates had predicted. CIA Director Mike Pompeo said in an interview last week the North Korean nuclear missile threat is becoming urgent. Pompeo said North Korea currently has a limited nuclear missile capability but is advancing toward a reliable nuclear strike weapon. "When they get to that point, they hold the United States at risk; the president has made very, very clear he's not going to permit that to happen," Pompeo said. 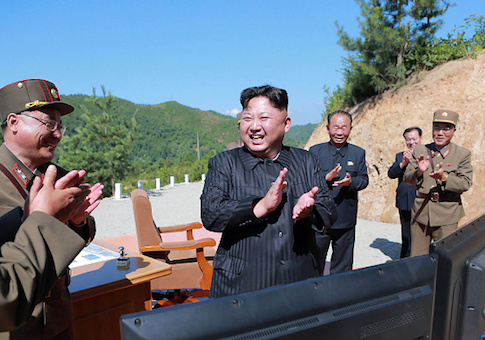 Until the July 4 test, North Korea was not expected to have a long-range strike capability for four more years. The new intelligence says the missile could be fielded by the end of the year. Earlier during a speech to a conference in Omaha, Neb., hosted by the Strategic Command, which is in charge of American nuclear forces, Brooks said North Korea is speeding up its strategic weapons development. He called the nuclear missile threat "a wicked problem that defies simple solution." Brooks has held three high-level positions as United Nations commander in South Korea, commander of combined U.S. and South Korean forces, and head of U.S. Forces Korea, with some 28,000 troops. "The North Korean program is accelerating in time," Brooks said. "Nearly weekly tests becoming the new normal. In the past year alone Kim Jong Un has tested 28 missiles, more than his father and his grandfather during their entire reign combined." Two of the regimes five underground nuclear tests were carried out in the past year. "Kim Jong Un is seeking the development of a credible, nuclear capability to deter what North Korea perceives to be hostility against it," he said, adding that its forces want to "hold at risk [South Korea], Japan, the full geography of the United States, and other countries in the region and well beyond the region." Additionally, North Korea is working to divide five nations that have been engaged in nuclear disarmament talks in the past, namely the United States, South Korea, Japan, Russia, and China. The objective is for the North Koreans to "buy time" to develop nuclear missiles. "So that means we're in a race, a race against time, and a race against a contest of will," Brooks said. Brooks also said during his speech that U.S. and allied efforts to deter North Korea from resuming the Korean conflict so far have succeeded. However, deterring Pyongyang from developing nuclear weapons and missiles that can deliver them has not worked. Brooks said the United States and international community is seeking to deter North Korea from developing its nuclear weapons and missiles. But he also warned that North Korea could face the prospect of being compelled to give up those weapons. "Compellance … must remain an option if North Korea does not choose to be deterred," Brooks said, using a term he coined to suggest that Pyongyang could be forced to eliminate its arms if deterrence ultimately does not succeed. "In other words, a real capability to inflict a cost if deterrence is broken must undergird the conditions of deterrence," he said. "There must be that credible consequence of breaking deterrence." Brooks said establishing that credible military option is done through exercises with the South Korean military and the deployment of nuclear-capable aircraft and submarines. Unlike war, which seeks to bring an enemy to his knees, the use of deterrence in strategic competition aims to force adversaries to "reconsider their resolve," he said. "With North Korea, we are not seeking to bring them to their knees; we're seeking to bring them to their senses," Brooks said. North Korea is continuing to defy international sanctions imposed as a result of its nuclear and missile programs. "They continue to pursue their ballistic missile programs and they continue to seek to make the missiles with a nuclear payload," he said. Brooks challenged claims that South Koreans are opposing deployment of the U.S. Terminal High Altitude Area Defense, or THAAD. Opinion polls in South Korea have shown that support for fully completing THAAD deployment is increasing, as North Korea speeds up the number of missile flight tests, he said. Brooks said China's opposition to THAAD deployment is "ill-founded." Beijing has opposed the missile defense system over concerns it could be used to counter Chinese missiles deployed in the northern part of the country. "This is an operational deployment against a living threat that fire at any time, and it has to be viewed differently than just an administrative deployment or a capability demonstration," he said of the first THAAD battery in South Korea. THAAD adds to deterrence by placing a missile defense "umbrella" over part of South Korea that reduces the targets Kim Jong Un can hold at risk, he said. Rep. Mike Rogers (R., Ala.), chairman of the House Armed Services subcommittee on strategic forces, voiced concerns about the North Korean ICBM development. "I'm alarmed at North Korea's urgency and our lack of it," Rogers said in a statement. "North Korea is moving at a rapid pace to develop its ballistic missile capability, including ICBM capability. On the other hand, we have been ignoring missile defense for eight years thanks to the previous administration." Brooks also criticized China for not doing more to rein in North Korea. The commander recalled that a senior Chinese military leader told him that China does not have as much influence as the United States believes. "That might be true but they clearly have more cards in the deck than they've dealt out," he said. "And so our expectation is [for China] to put some cards on the table." China has unique influence but not control and should do more, he said.